As the lies of Chicago Public Schools top officials during the Reign of Rahm continue to escalate, CPS robo called every CPS parent on July 17 to announce that on July 18 the school system was holding a "Tele Town Hall" on the "budget." Nobody was able to call back to CPS and ask why the "Tele Town Hall" was taking place precisely one week after CPS held six hearings on July 17 at various campuses of the Chicago City Colleges, promised to answer every question that was asked during the hearings and publish the transcripts of the hearings "within a day or two" — and then broke every one of those promises. Chicago Public Schools "Chief Communications Officer" Becky Carroll (above, second from right) is more likely to be quoted in the city's corporate media providing the Board of Education's talking point about the huge budget "deficit" that CPS has been claiming than Chief Executive Officer Jean-Claude Brizard, who has been kept from doing any public press conference for nearly one year. Carroll when discussing the supposed deficit (which CTU and Substance research finds to be a hoax) neglects to mention that the department she was hired to oversee ("Communications") has doubled in size since June 2011, when the Rahm Emanuel Board of Education took office and declared its "fiscal emergency" in order to justify reneging on a four percent raise to union workers. Substance photo by David Vance. Nor has CPS explained how the so-called "budget" it has presented to the public relates to anything that has happened in the past. What the public has gotten is a vague Web-based thingy that changes almost daily in some portions, while CPS officials refuse to print and make public even one printed copy of the thing. Given that for more than a hundred years, Chicago Public Schools has published its proposed budget and distributed it to every alderman, library, and school in the city, the "Rahm Revolution" is certainly a model of something less than the "transparency" CPS officials prattle endlessly about. Were the $5.2 (or $5.7 billion, if you include "capital") budget not so serious, it would be a joke, although the joke is on the parents, teachers and taxpayers of Chicago. Truly, the FY 2013 'Proposed Budget' is unprecedented — but what it represents is what happens to a major public institution when it is taken over by people who are hostile to the public services necessary in a democracy and whose real agenda is to dismantle the public schools of Chicago. The seven members of the Chicago Board of Education appointed by Mayor Rahm Emanuel in May 2011 will talk endlessly about their commitment to public schools, but when they act, they always act in hostility to the public schools. The Proposed Budget is just the latest and most dramatic example of that cynical hostility. As to so-called "transparency", this hidden budget is just the latest example of the cynicism. A month before CPS unveiled its hidden budget, Cook County published its proposed budget in both the Chicago Sun-Times and Chicago Tribune. 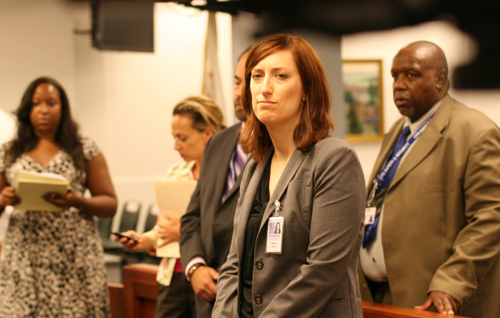 If asked, CPS officials would claim that publishing the budget was "too expensive." But the cost of publishing the budget for every library, aldermanic office, and school would be less than CPS is paying this year for the extra services of a second "Chief of Staff" to the CEO (see related Substance story this month) or for the extra half million dollars worth of propagandists added to the CPS "Office of Communications" under the $165,000-a-year mathematically challenged "Chief Officer, Communications," Becky Carroll, since the Reign of Rahm began. The list of out-of-towners who have been brought in to thrust privatization forward since May 2011 would pay for the printing of the budget out of their "relocation and transition expenses" alone since those who run Chicago's public schools decided that Chicago doesn't have people with education experience capable of running it public schools system. Don't worry, President Obama will support our Union! President Obama has been telling us that the middle class is important to him, that working class people are important to him, and so I say don't worry, President Obama will support our Union! After all President Obama is the leader of our Democratic Party! He will step in to help the people of his adopted home town! And I know you are wondering, but no, I have not been drinking or ingesting illegal drugs, I am just being optimistic! I think more of us should spout this and perhaps it will become reality? As opposed to playing: Where's Obama?